Maximize CPU and GPU synergy with the AMD APU-compatible ZOTAC A55-ITX WiFi mini-ITX platform for a revolutionary system that combines multi-core processing with up to 384 AMD Radeon™ cores. The ZOTAC A55-ITX WiFi packs an AMD FM2 socket ready to accept AMD APUs with discrete-class AMD Radeon™ HD 7000 series graphics processors for outstanding Microsoft® DirectX® 11 visuals and world-class high-definition Blu-ray and streaming Internet video playback. 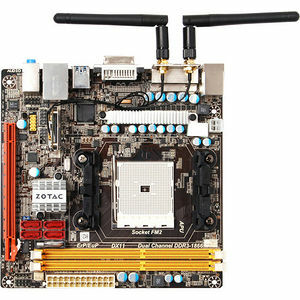 The AMD FM2 socket is accompanied by class-leading expansion capabilities with the ZOTAC A55-ITX WiFi including a PCI Express x16 slot, 4 SATA 6.0 Gb/s ports with RAID 0, 1, 0+1 support and up to eight USB 2.0 ports. The ZOTAC A55-ITX WiFi also packs superior networking capabilities including Gigabit Ethernet, 802.11n WiFi and Bluetooth 4.0 for connectivity with your wired and wireless network, and wireless devices and peripherals.